If you were an amphibian or reptile, what kind of culvert would you choose to cross under the highway? For us, it’s an important question because the Ministry of Transportation and Infrastructure wants these critters to use culverts as tunnels, to move safely below highways. We really don’t want them risking their necks (though it’s difficult to identify the neck on a snake or frog) by crossing over pavement. So, we’re testing two kinds of culverts in the Nanaimo area, to see which passage is preferred. The different designs affect the temperature, light and humidity of each culvert’s interior. 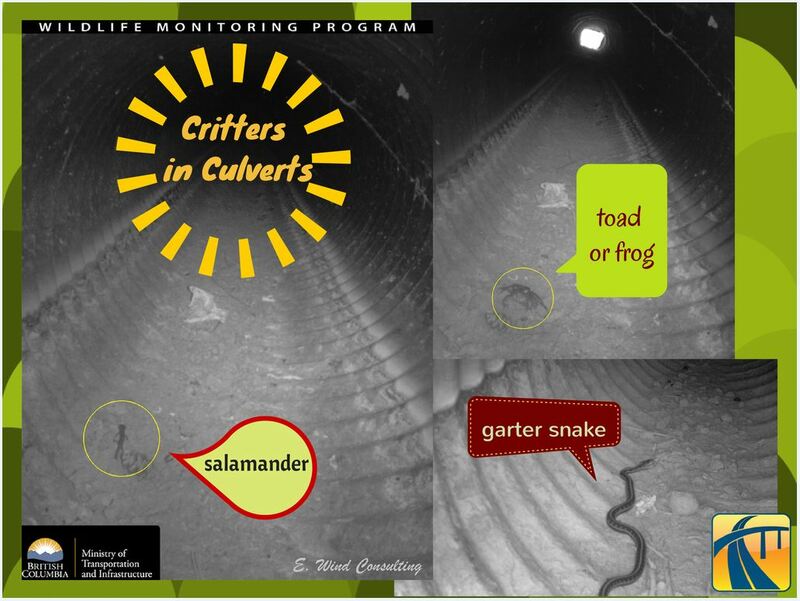 To find out which culvert the creatures – those like toads, turtles, salamanders, snakes and newts – choose, we’re using cameras to capture their travels. Stay tuned for the findings on which passage is more welcoming to our web-footed and scaly friends. In the meantime, here’s some other ways we’re working on wildlife safety along B.C. highways. TranBC Trivia – Did you know there are about 180,735 culverts (plus 669 culverts wider than three metres in diameter) below provincial highways? Thanks for caring for creatures other than us! great job! Thank you for all of the very proactive ways to protect amphibians and reptiles (and who knows what else might use these under road corridors.) With the huge increase in population in the areas that these amphibians must transit the mortality rate has been so high! This is clearly a positive way of helping to support those sensitive species in their journey through man-country. Thanks for the positive feedback Cynthia! We appreciate it.